Valerie has returned to New York in a time of reckoning. When an enemy declares war on her and her friends, there's no holding back. The whole gang reunites for a fight-fest of epic proportions that promises to determine the fate of their lands once and for all. These are the trademarks of this new world. These are the lynch-pins she and hers have set in place, and they refuse to let anyone try to break them down. Defending the Lost is part of the Kurtherian Gambit universe. 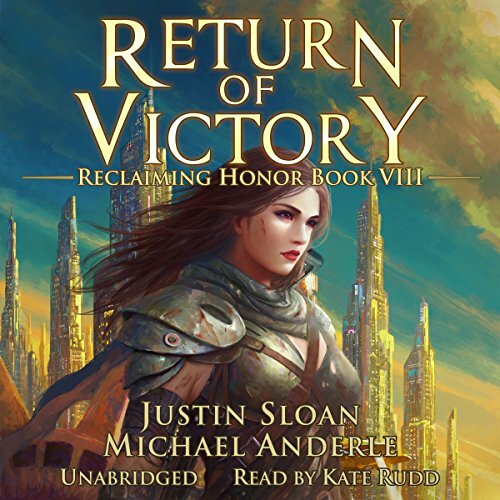 Would you consider the audio edition of Return of Victory: A Kurtherian Gambit Series to be better than the print version? Yes, I injoy reading the printed books but love what a good narrator can do. I injoy the way Justin and Michael tie the end of this one into the next set of books, and of coarse the fast pace and action of the story. Yes, Kate really brings the people to life. OK so I loved 💗 this series and want more! I Love this series! Love the characters and Kate Rudd performance as narrator of this series is fantastic! It seems that the Kurtherian universe has many opportunities for good stories. I like the leadcharactr, Valerie, and I look forward to her further adventures in the next series.